Potato is the most underused vegetable in my kitchen even though the husband is very fond of potatoes. In winters the new potatoes make great alu paratha but we don't eat potatoes in summer at all. Some alu parval ki bhujia is made sometimes but apart from that there is no potato on our summer menu. This recipe of sookhe alu becomes an exception sometimes and we both enjoy having it with a relaxed weekend brunch. Our weekend brunches are invariably relaxed and simple meals, something weboth like. 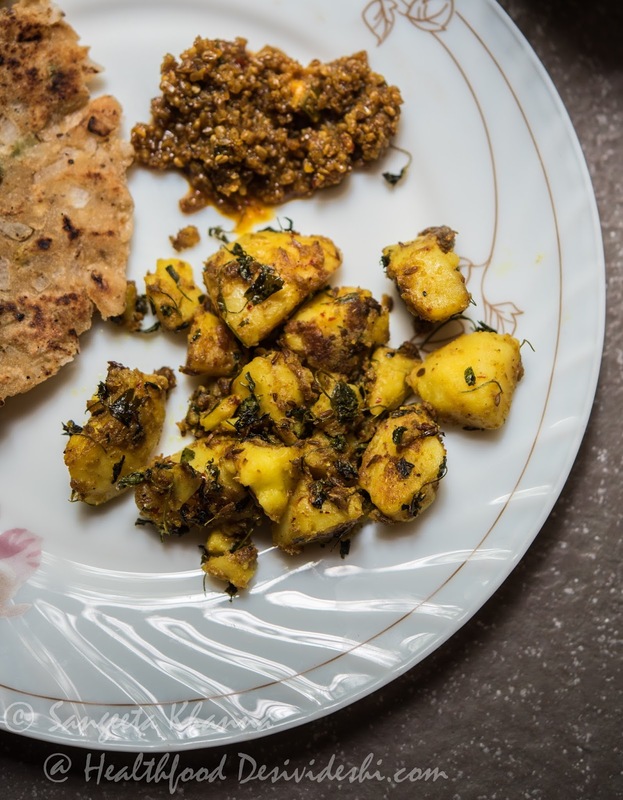 This sookhe alu was made a few weeks ago when I noticed I had not used the potatoes that I had grown in my garden. This recipe became the excuse to eat the home grown potatoes. I remembered my research guide Dr. Maya Goyle a lot when I was cooking it. Her step daughters in Denmark used to love this and call this as brown potatoes because of the brown masala used. The brown masala is nothing else but the everyday curry powder that has prominent notes of coriander, tejpatta and cumin with mild heat of black pepper. With a tart hint of amchoor and aromatic kasoori methi this sookhe alu becomes a treat for the senses. Incidentally, I always end up making this sookhe alu whenever I grind thee masala mix of my everyday curry powder. The aroma of this freshly milled spice blend always reminds me of this dry stir fry and I give in to the indomitable pleasure of potatoes. I think sooke alu made with boiled and cooled potatoes is a genius recipe and I can't take credit at all. It is the recipe I learnt from Dr. Maya Goyle and its taste still connects me with her, now that she is no more in this world. Heat oil in a pan and throw in the cumin seeds, let them splutter and get aromatic. Tip the cubed potatoes with salt and turmeric powder and stir fry on medium heat till they turn golden brown. The slower this step is the better the potatoes taste. So take your time, make this sookhe alu when you are doing something else too in the kitchen. 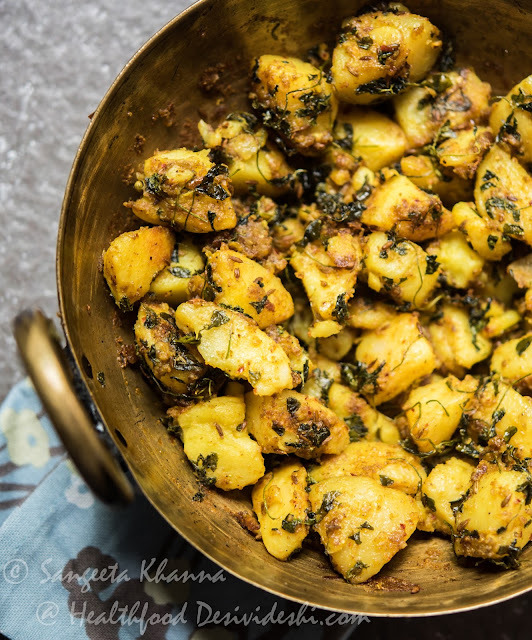 Add the curry powder and red chilli powder once the potatoes looks adequately browned and fry some more till the masala becomes aromatic, sprinkle amchoor powder, mix well and it's ready. Serve with paratha and pickle or eat as a snack. Trust me this sookhe alu mostly becomes the appetizer in my household. Here you see the sookhe alu with pyaz ka paratha and a Gujrati pickle called Methiya athanu. I will post the recipe of Methiya athanu soon. 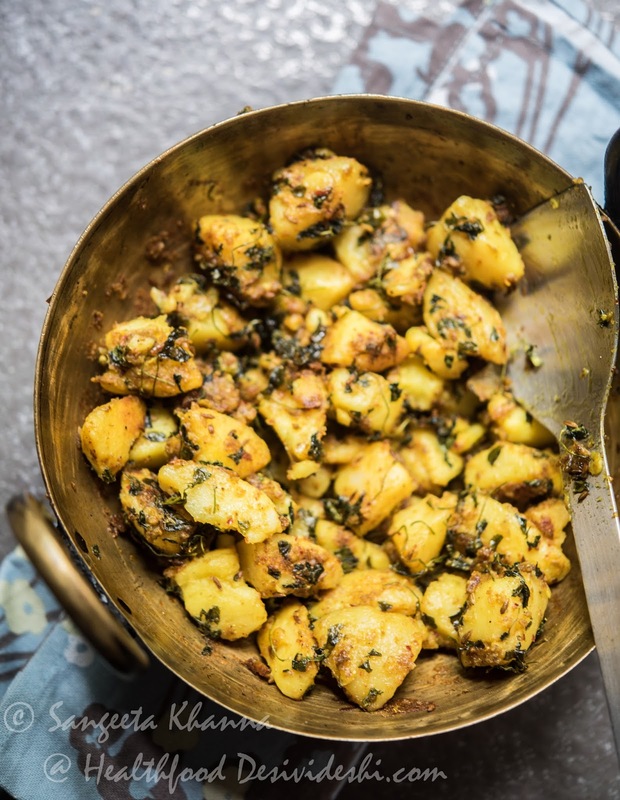 The slow cooked potatoes with this spice blend becomes magical if you trust me. There is no onion garlic in this recipe and the flavour is absolutely rustic and robust, kasoori methi giving it a slight bitter whiff. This is far better than any French fry of the world, and you don't even need any tomato ketchup with it. This sookhe alu tastes great even if stuffed in a grilled sandwich. Actually this was the most common grilled sandwich we used to make with evening tea back home. hi Sangeeta, for those of us who have not used mustard oil before. Is it to be used just like any other oil? Basically heated and then rai/jeera. Some places say you have to heat it till it smokes and then cool it down. Please advise on how exactly to heat the oil for vaghar. Thank you. I never smoke any oil for vaghar or tadka because that makes the oil devoid of all nutrition and flavour. People who like to smoke mustard oil want to get rid of the flavour of mustard oil. Please try and heat the mustard oil normally for tadka even if you are using it for the first time and see if you like the flavour. You can use any other oil or ghee if mustard oil flavour doesn't suit you. Hope it helps. I love digging your old post for some nutritional recipes. What is amaranth called in HIndi. Is it Rajgira. I get rajgira ka atta but as a grain what is it called. Is it a millet. I am so confused with all this millets jowar bajra amaranth. Please help. Sangeeta--when do we need to add the kasuri methi? Butterfly thoughts--chaulai? Bajra=pearl millet. Jowar=sorghum. You can add kasuri methi along with amchoor or a little before that K. Some people like the aroma of kasoori methi fresh so they add it in the end after crushing it with hands. I will edit the text to add the step. Chaulai is rajgira or amaranth.